Bayview Tower was completed by MacMaster Constructions in 1990. It is a truly magnificent building - both in terms of quality of structure, level of finish, range of facilities and value for money. This 29 story tower comprises a total of 109 apartments (including four sub penthouses and two penthouses) and is the only building within the Bayview Harbour complex featuring a heated indoor swimming pool, an outdoor pool, heated spa, sauna, gymnasium, tennis court, function room and three BBQ areas. There are four apartments on a typical floor. Type A (dominant aspect north) offers 22.7 squares (211.3 m2) and two bedroom, family (or office / spare room) design with a huge kitchen (Bosch appliances) and a tremendous provision of storage / cupboard space throughout. Type B (dominant aspect north-east) offers 21.9 squares (203.9 m2) and two separate huge living / dining / family room areas, two king sized bedrooms, two lovely bathrooms, separate laundry, sensational kitchen (Bosch appliances) and three! balconies of very generous proportions. Type C (dominant aspect east) offers some 15.5 squares (144. m2) and features granite tiled entrance foyer, lounge / dining extended by wide, sheltered balcony, two bedrooms, with main bedroom services by ensuite (twin washing basin), plus another bathroom, separate laundry, and lovely kitchen with an enormous pantry and imported Bosch appliances. Finally Type D (dominant aspect south-east) offers 22.5 squares (209.4 m2) of living area and features 2 hugh bedrooms, separate family / TV room (which can be converted in to and office, spare room), huge lounge / dining, enormous kitchen (again with Bosch appliances), two bathrooms, separate laundry and lots of storage cupboards throughout. 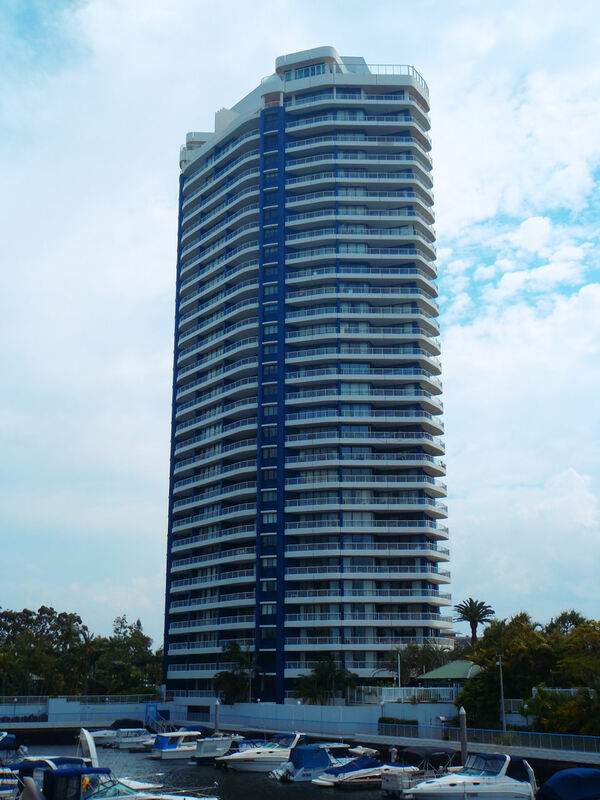 Most apartments in Bayview Tower enjoy superb Broadwater, ocean and mountain views. The 44 square sub penthouses and 80 square penthouses in Bayview Tower are among the best in Australia. There are currently several apartments for sale in Bayview Tower, priced from AU$600,000.00, depending on size and position within the building, car space / storage/ marina berth allocation and presentation. Please call or email with any inquires.